In the words of Singha themselves: “Greatness is an Endless Journey”, which certainly runs true to their on-going global brand development. With three state of the art breweries across Thailand, Boon Rawd Brewery has been creating Thailand’s most loved beer, soda water and drinking water for over 80 years. With Singha available in more than 50 countries around the world, they truly are one of Thailand’s most recognizable & successful brands. As a wholly owned subsidiary of Boon Rawd Brewery Co. Ltd, Singha Asia was established in 2015 as the platform to expand its regional footprint into neighboring Indochina markets. With a strong focus on growth in complementary product categories, the company prides itself on investment strategy, partnership development, portfolio management and providing support for operational improvements. 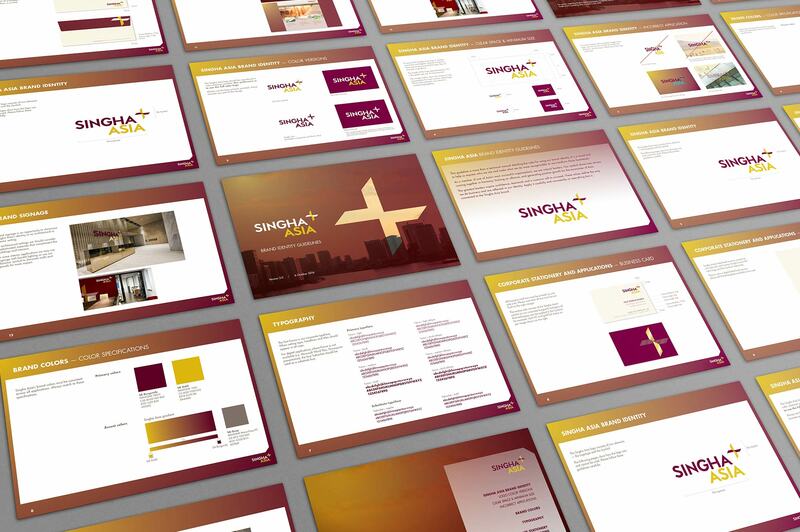 Brand Family briefed Brand New Day Asia to design a distinctive brand identity and visual identity system to help Singha Asia express who they are and make what they do more recognizable as they transform Asian businesses. The work scope included brand identity, stationery, signage design, PowerPoint templates and a new website look and feel. The modern and forward-looking Singha Asia logo designed and developed by Brand New Day Asia includes all the elements of Singha’s values. Rich in Asian heritage by combining burgundy and gold colours, the symbol was created by abstracting a shape evocative of birds in flight or a school of fish and is truly reflective of a dynamic company that is continuously in motion and driving towards its goals. The broader Singha Asia visual identity system was further enhanced with strong colour blocking and the symbol was subtlety applied across a suite of brand applications and with striking dramatic effect to the investment holding company’s interior signage.